We hear this one a lot, and the confusion is understandable. When you edit a date or time in Forestry, the times you input are based on the timezone reported by your web browser. You will see this feedback in the Forestry UI. For example, if you are in the Eastern time zone during daylight savings, you might see 8:00 AM -0500 as the time zone in the date field, because your current timezone is UTC-5. However, when this data is saved in the site’s git repo, it will be converted to whatever timezone is set in your site settings. So in our example, if the site is in the Atlantic time zone (1 hour ahead of Eastern), you will see the time zone saved in the file’s front matter as 09:00:00 -0400. The most important observation we can make here is that these are the same times, just in different time zones. 08:00:00 -0500 is equivalent to 09:00:00 -0400. 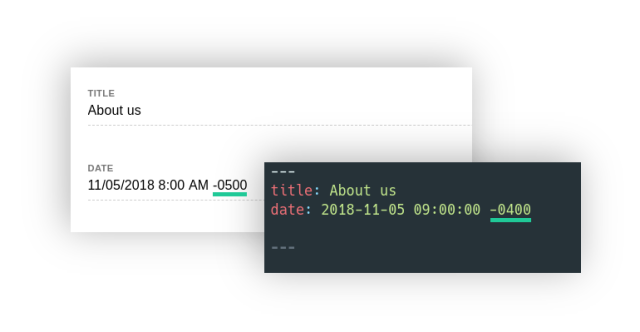 The upshot of this behavior is that anyone editing content on your Forestry site will be able to edit dates and times relative to their preferred time zone, but when the content is saved it is all normalized to the same timezone across the entire site. How to use YAML or JSON for Front Matter with Hugo?How To Transfer a Site to an Organization?